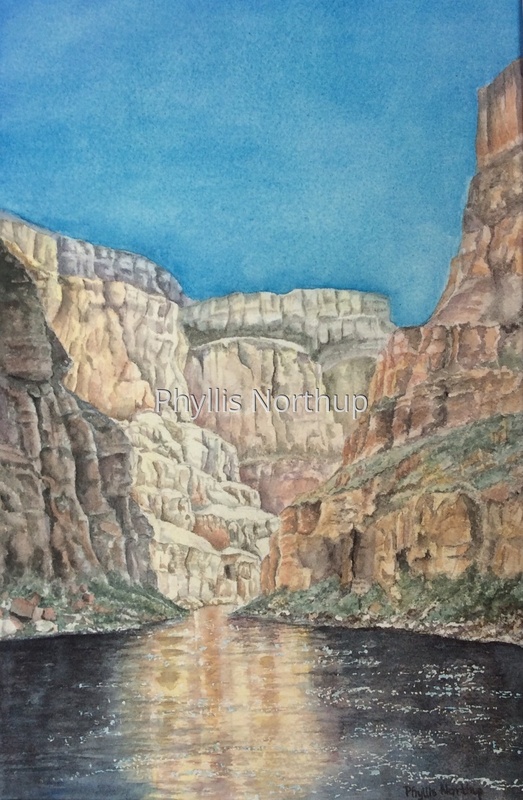 The Colorado River flows 277 miles through Grand Canyon National Park. The canyon walls are an open book of the geologic history of earth, with layer after layer of exposed rock. Encompassing 1,218,375 acres, and at some points 18 miles wide, the immensity of this canyon can be overwhelming. The 6,000 foot elevation change provides a variety of ecosystems, five of the seven life zones and three of the four desert types in North America. The hiking is challenging and amazing! A River trip through the canyon provides a different experience; looking up at the sky through the narrow slot between canyon walls, surviving heart thumping rapids, and exploring numerous side canyons and waterfalls. This is one of a series of paintings "My Backyards" , celebrating the beautiful places I have been privileged to call home. Framed to 12 x 16. Giclee prints are now available of this image.